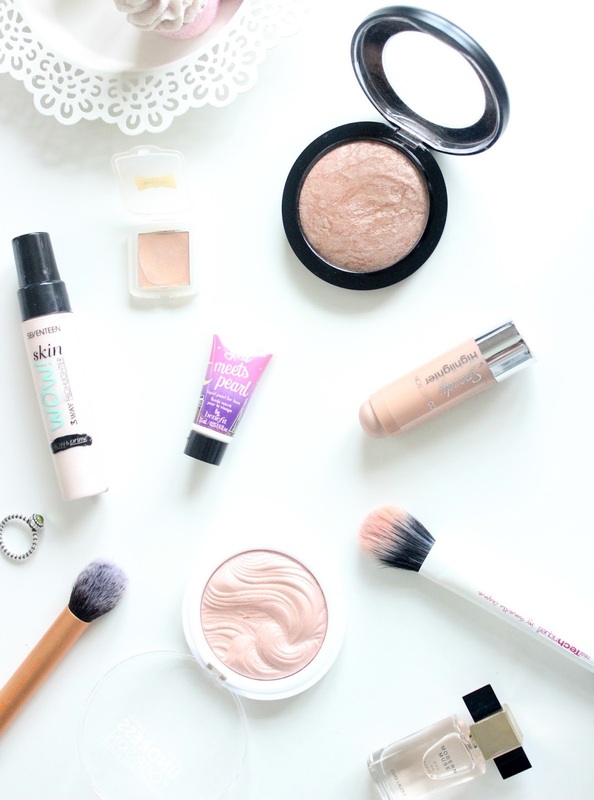 I have to say, one of my favourite beauty products has definitely got to be highlighter. I just love how they provide the skin with a glowy radiance and make even the most zombified look more bright and awake (usually me). I always thought cream highlighters were my fave, but after trying a couple of powder & liquid ones I've now decided that I just love all forms of highlight! I can't discriminate, lol. Liquid highlights are great as they can be dabbed onto the cheekbones or anywhere else you like to highlight; they can be applied as a primer to add a subtle glow underneath your foundation and they can also be mixed in with your foundation, which is my favourite way of using them. One of my absolute favourites has got the be the SEVENTEEN Skin Wow 3 Way Highlighter*. It's quite scary when it first comes out just because it's so white and shimmery, but when mixed into foundation it turns any foundation into a much smoother, glowier base. Love it! Another one I've really been loving, which is different to the above, is Benefit's Girl Meets Pearl. It's more of a golden pink which leaves a pearlescent sheen to the skin. Mixed with foundation it's a BEAUT, but I do love to dab this on the cheekbones aswell, as it leaves the most beautiful sheen which isn't as obvious as the Skin Wow when used the same way. Cream highlighters are so great, I think, because of how easy they are to apply. They're usually just require a dab / swipe and a little blend with the finger and you're good to go, making them great for travel or to pop in your clutch on a night out. A firm favourite of mine has to be the Benefit's Watt's Up. I only have the sample size which I got in the Cheeky Sweet Spot Gift Set, but oh wow do I love it! It's the most gorgeous champagne, cream-to-powder highlighter which is soft and subtle but really illuminates. A much more afforable dupe of this I'd say is the Collection Speedy Highlighter in the shade Pearl Sheen. It's a twist-up stick which I love for on the go, as it's literally just swipe, blend and cyaaa. Given that it's only £3.99, it's seriously well pigmented and super creamy, and it dries to a powder finish meaning it won't slip and slide around the skin! Fab product! Powder highlighters are probably the more fool-proof formulas for beginners, as they can be just patted on with a brush. My first high-end powder highlighter purchase was MAC's Mineralize Skinfinish in Soft & Gentle. It's a highlighter that I'd had on my wishlist for the longest time because pretty much everyone talks about how amazing it is. It's a highly pigmented, metallic champagne highlighter with slight gold/pink running through it. I like to use my Real Techniques Contour Brush to lightly pat this onto my cheekbones. A little goes a long way with this and I'm so glad I have it in my collection. Another, much more affordable powder highlighter is the MUA Undress Your Skin Shimmer Highlighter. At just £3, it obviously doesn't have the best packaging, but the product itself is a good one. It's much less pigmented than Soft & Gentle, but it gives a lovely, subtle glow when popped onto the cheekbones.